Before the holidays kicked off, Ducky and the gang went on a family vacation to the Lake District in Northern England. They went on several boat rides, hiked lots of trails, and even rode some old fashioned choo-choo trains. Each had their own favorite moment. Ducky’s favorite part was when we got caught in a “lamb jam” (traffic jam caused by grazing sheep), when driving on old country roads. They got several good laughs as humans tried to shoo the sheep off the road. Pembleton’s favorite part was hiking around Lake Derwentwater. He cataloged different plants and animals he spotted along the hike in his science journal. Ted’s favorite part was the bird show at Muncaster Castle. He liked seeing the hawks soaring in the sky and swooping over the crowd. Blizzard’s favorite part was eating lots and lots of sticky toffee pudding! It is his favorite dessert in all of England, especially when topped with ice cream. Hello from the Lake District! 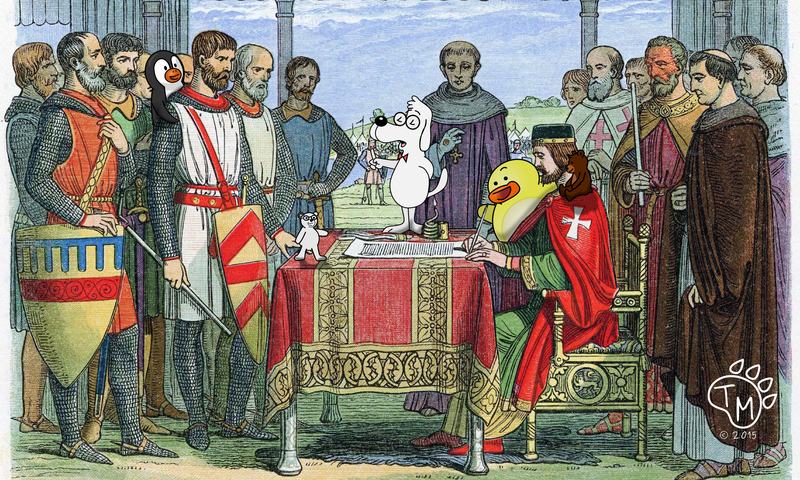 To celebrate the 800th anniversary of the signing of the Magna Carta, Pembleton introduced Ducky, Ted, and Blizzard to his old friend Mr. Peabody. “Who is Mr. Peabody and why are you so excited for us to meet him?”, Ducky asked. “Just wait. You’ll see”, Pembleton replied. When they arrived, Mr. Peabody talked on and on about something he called a “wayback machine”. They all got inside the machine, and to Ducky’s surprise, they were suddenly transported back in time to 1215 in medieval England! There were a bunch a funny looking men, all standing around a fancy piece of paper. Pembleton started geeking out, and Mr. Peabody explained that this historical document meant that the King or Queen of England had to follow their own laws. In essence, the Magna Carta established that no man, or animal is above the law. After the signing of the document. Thy all got back in to the “wayback machine” and were instantly back in the year 2015. Ducky was really happy to be back home, because he was really hungry and it was snack time. DtPb are sad to hear one of their heroes, Leonard Nimoy (Mr. Spock) has passed away. Thank you for the memories, they will live long and prosper in our hearts. Last night, Ducky dreamed that him and Pembleton were in a video game. They almost got eaten by Pac Man and they had to jump from one platform to another collecting bananas. Then after rescuing a princess, they met up with Donkey Kong and who ate all the bananas they collected. While it was fun being in a video game, Ducky is glad that he isn’t stuck in there and can enjoy the real outdoors. Nice to meet you Mr. Kong. Thank you for being a part of Ducky’s Adventures! P.S. Congratulations to Germany for winning the World Cup. We tried to reach The Lambs for comment, but they were busy napping after a long night of celebrating. Sorry it took us so long to update.The humans won’t quit traveling. All they do is work, work, work, and travel, travel, travel! We are finally back and ready for more ADVENTURES! Once freed from the ropes, Ducky and Pembleton quickly ran to where the dinos were being held captive. “Hurry, we have to catch Professor Plumbottom and the Cat Pirates. We can’t let them take Xanadu!” Pembleton shouted. Ducky and his dino buddy charged down the pier. Ducky shouted, “Tally Ho!” as they jumped off the pier and into the water. The Cat Pirates were already in their hot air balloon. Captain One Mitten, always ready for the escape. But the Professor, who was old and portly, struggled to get in to the balloon as it slowly drifted away. “Not so fast, Professor. You’re not going anywhere!” Ducky said as his dino buddy grabbed his robe. “Help Captain One Mitten,” the Professor cried. “Sorry, but I need to live to tell another tale,” he said as he pried his fingers off the basket. 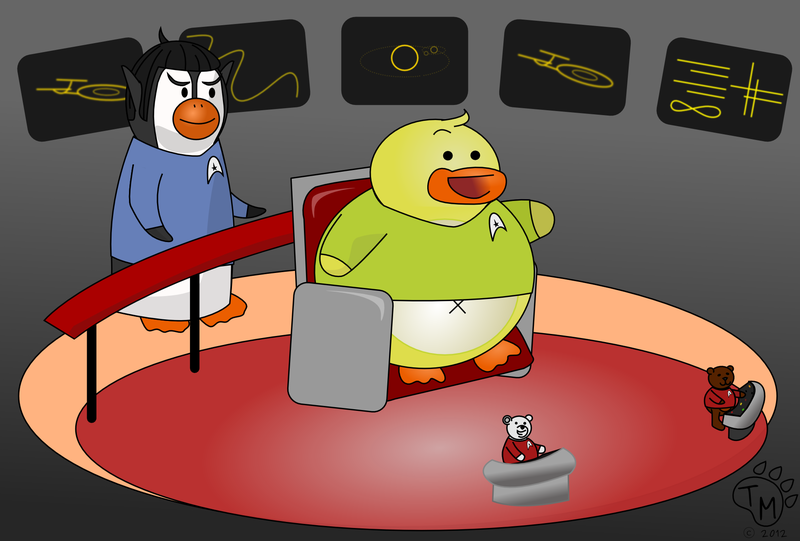 “Till we meet again Ducky,” the Captain said slyly as he floated off. “Next time,” Ducky replied unhappily as the Cat Pirates once again got away. 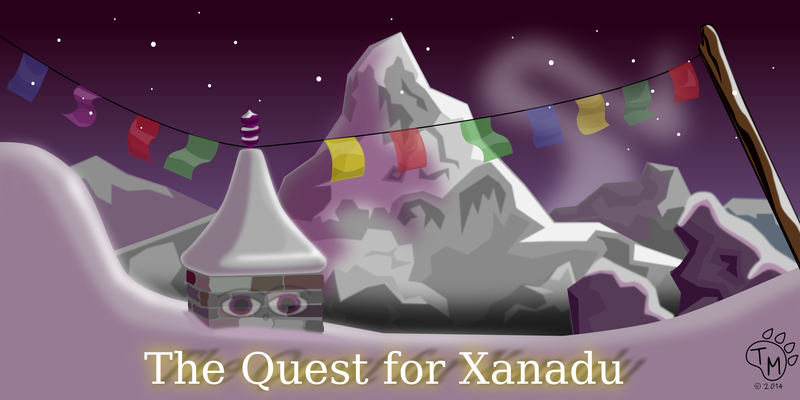 For more on “The Quest for Xanadu” Click Here! “Yeah, yeah, get to the point!” Ducky interrupted. “How is Xanadu going to make you rich?” Pembleton asked. “Who cares about the Animal Adventure’s Society. I have more pressing matters to attend to. Captain One Mitten, take the T-Rexs to their new cages.” Professor Plumbottom ordered and promptly left. It took Ducky and Pembleton about 0.37 seconds after entering the Forbidden Caves to know why no one had ever returned. “Whaaaaaaa…. !” They were sliding completely out of control on a river of icy slush. After a few seconds, Pembleton seemed to get the hang of things and Blizzard climbed on to his back. Ducky flailed his arms trying to keep Ted above the water; he eventually figured out how to ride the icy river rapids. “But where is the plane now?” Blizzard asked. The gang got off at the last stop – a small Tibetan monastery on a high mountain peak. Pembleton knew some of the animals there and figured it was a good place to start investigating. But as the train pulled away, reality set in, and amidst all the snow and ice, Ducky had a meltdown. “I’M SO C-C-COLD!” Ducky blubbered. “Don’t worry Ducky, we will get you thawed out once we get inside,” Pembleton replied as he offered Ducky the last cookie. “I hope your friends have some warm clothes for us, Ted and I can’t handle this cold weather as well as you and Blizzard!” Ducky said between sniffles. “Let’s get inside. Harry the snow hare is waiting for us. He should have some gear for us.” Pembleton said, as they headed toward the monastery. Since there was no way to send Ted and Blizzard home, Ducky and Pembleton decided they would have to come with them on their adventure. 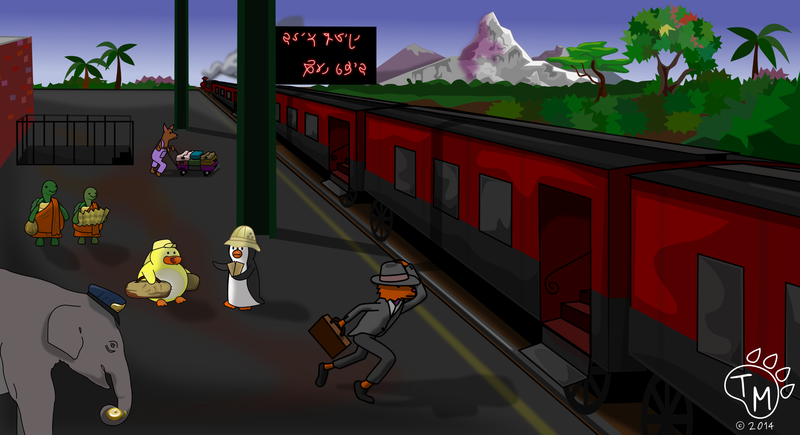 Traveling by train into the Himalayas, there wasn’t much to do. So Ducky and the gang decided to order snacks. The train’s menu had cake, rice pudding, and a Yak’s milk yogurt. Pembleton was feeling very tired and Ducky convinced him to order one of everything, but only Ducky tried the Yak yogurt. 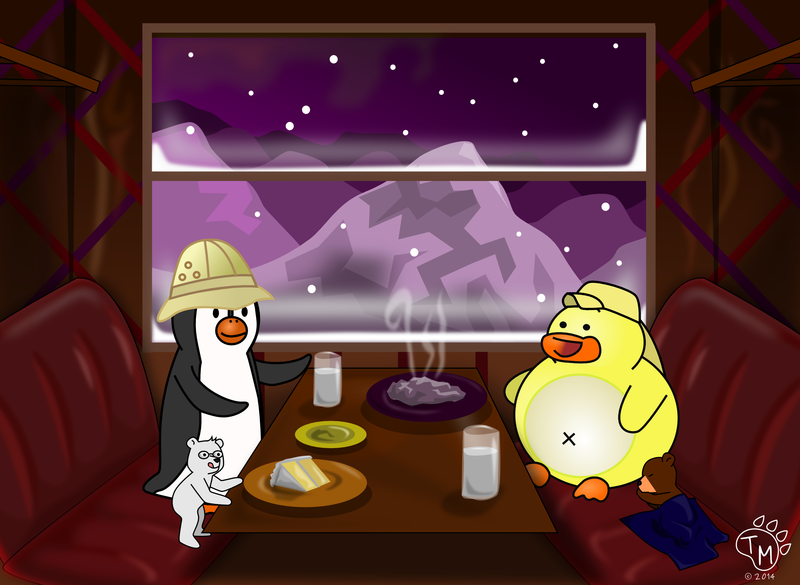 From their cozy train cabin, they nibbled on their snacks and watched the green hills grow into snowy mountain peaks as they headed up and up and up into the Himalayas. Once on the train, Ducky and Pembleton found their reserved car. “I can’t believe we made it Ducky! That was a close one,” Pembleton said. “Yeah. Close calls make me hungry. Can we eat now?” Ducky asked. Once Ducky and Pembleton weathered the storms, it was smooth sailing. “A train? I love trains. Will there be a snack car?” Ducky said all excited. “Hey, Pembleton? Is that, who I think it is?” Ducky asked. “Great! We are on an adventure and our train is about to leave any minute. Can you direct us to the right train?” Ducky asked. “You are in luck. It’s right behind you and I’m about to give it the go ahead. Hurry up and find your seats. And good luck on your adventure.” Edgar said. Ducky and Pembleton packed their gear, then dropped the lil’ guys off at Mrs. Cottontail’s cottage, before heading to the airfield. Things were running smoothly until a patch of dark clouds appeared on the horizon as they were over the Horn of Africa and entering the Indian Ocean. “You’re right! 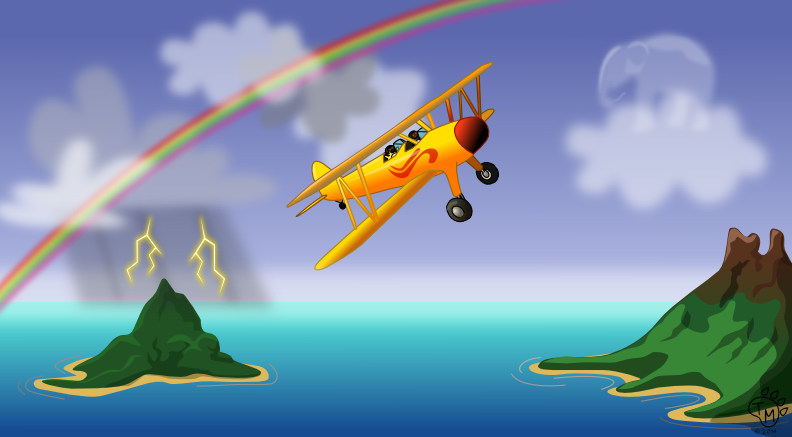 It is!” Pembleton turned the plane to follow the elephant and within a matter of minutes they were leaving the thunder storm behind. They waved goodbye as they passed their fluffy elephant buddy and headed off into clear blue skies. “I can’t believe Professor Plumbottom blocked my request to fund this rescue operation!” Pembleton shouted across Lionheart’s large oak desk in the Animal Adventurers Society presidential office. Ducky just sat quietly in a plump chair munching on some delicious cookies. “One more thing,” Lionheart said as they were in the doorway. “What is it?” Pembleton asked. “What is the problem? What is your current position?” Pembleton shouted into the microphone. Then he heard some rustling of nobs and buttons, “We are losing altitude too quickly. Our rudders aren’t responding to controls, and our GPS is all wonky, but we should be just south of the Himalayas.” Then there was some more rustling and a faint “Wow, this place does exist,” before a loud CRASH!!! 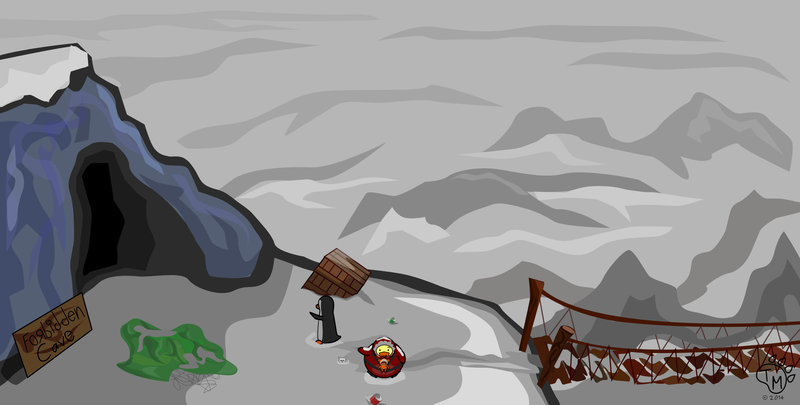 Ducky and the gang are about to go on a new multipart adventure into the unforgiving Himalayan mountains. On this adventure, they will face danger at every turn, overcome impossible odds, meet new friends, and discover the secrets of a lost civilization. Stay tuned for the first part of this exciting adventure. 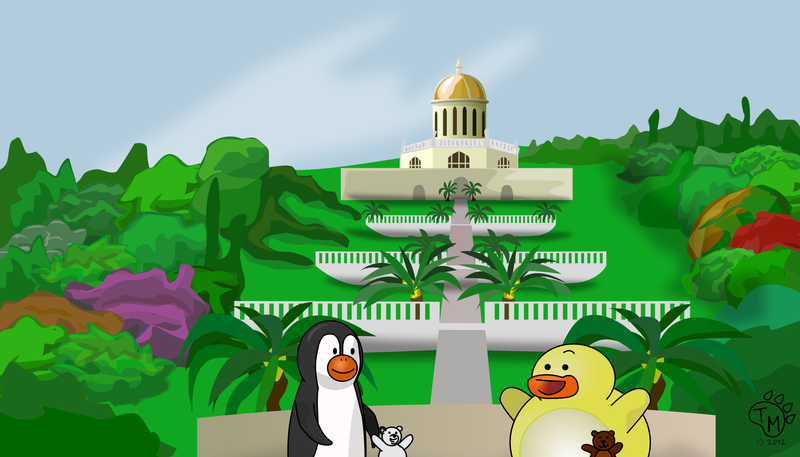 Ducky and Pembleton are living in a mysterious and amazing place called Haifa, Israel. Every weekend they explore new places in the city. Last weekend, they explored the Haifa zoo and met lots of new friends. Today, Pembleton woke everyone up early and announced that he found an amazing place called the Bahai gardens, right here in Haifa. So they packed their backpacks with snacks and juice and took the bus downtown. Ducky turned to him and said, “Don’t worry Pembleton. I’ll ask someone for directions.” Once Ducky got directions from a local puppy, they discovered they were only one street over from the entrance to the Bahai gardens. The gang spent all day exploring the incredible Bahai gardens, and when they were done, they finished the afternoon with lunch and an ice cream cone. Before heading home, they stopped back at the base of the gardens for a group photo. It was a pretty awesome day. Once Ducky and the gang were discovered as intruders, the jig was up. 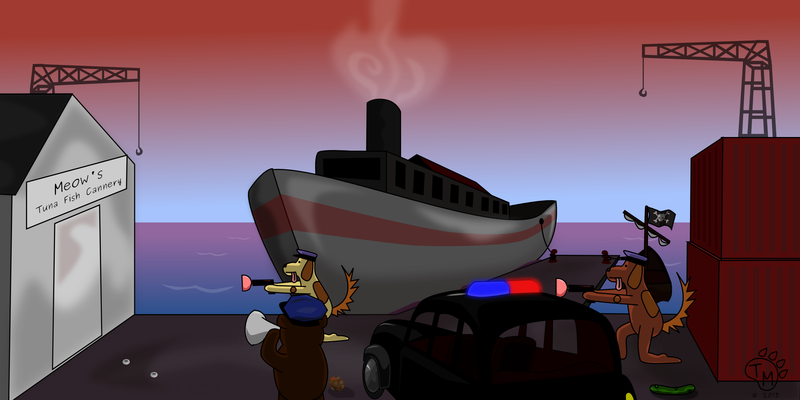 The cat pirates rounded them up and snatched Ducky’s mustache off. “Community theater? Sounds interesting. What’s his next play?” Ducky asked. Just as he spoke his last word, there were high pitched sirens from outside on the docks. “This is Scotland Yard. You are surrounded. Come out with your paws up and don’t try any funny business.” Chief Bear-Brown yelled through the megaphone. “NO!!!!! How do you always foil my plans?” Captain One Mitten yelled, as one of his crew members confirmed they were surrounded by the Scotland Yard K-9 Unit. Realizing they had been defeated. The cat pirates and Captain One Mitten were marched out of the cannery, by Conrad and were off to the pokey. Ducky, Pembleton, and Conrad dashed out of the museum and in to the dark London streets. “Where did he go?” Ducky asked. “That’s the easy part. Do you see the dark puddles on the road? The robot is leaving us a trail of oil we can follow. Let’s go.” Pembleton exclaimed. “Wait. I know a faster way,” said Conrad as he hailed a taxi. “Stop in the name of the law. I hereby commandeer this taxi by the authority of her majesty, the Queen.” The taxi driver was a little confused, but quickly got out of the car as Ducky, Pembleton, and Conrad climbed in. 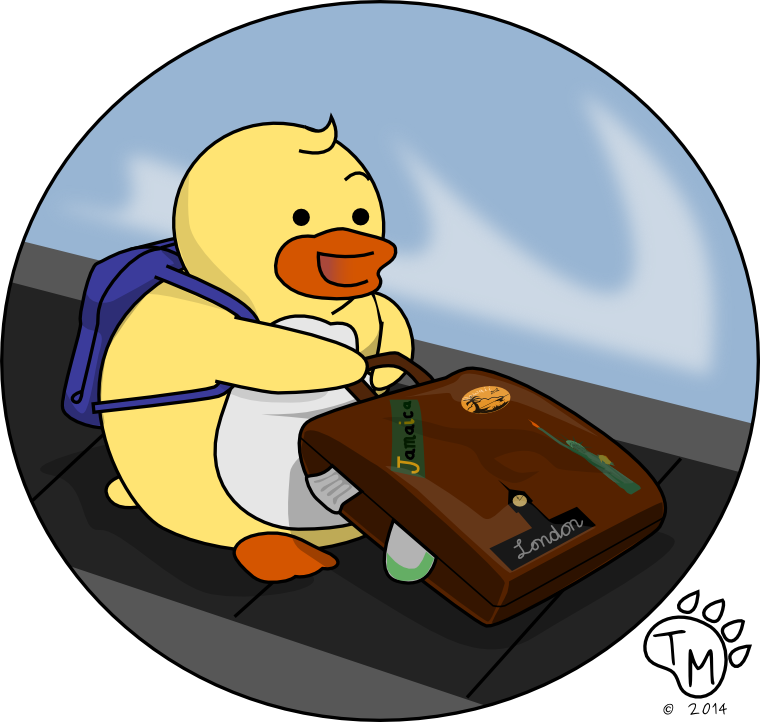 “Where do you think he is going?” Ducky asked. “I think I might know, but let’s not take our chances. Follow that trail!” Pembleton shouted. “How is such a robust robot so fast?” Ducky asked. Pembleton, Ducky and Conrad took a taxi to the museum. When they reached the London Animal Museum, Ducky was amazed by how large it was. The building took up two city blocks and was made of marble. They climbed the marble staircase to the main entrance. There they were met by two mole security guards wielding squirt guns. “Freeze or you’ll get a mouth full of cold stinky swamp water,” one mole said with a Scottish accent. Conrad hurriedly explained the situation and the other mole radioed in for the central security chief to let them in the museum. They entered the huge lobby and were greeted by a several museum exhibits. “Whoa! Check out this wooly mammoth skeleton. I wish Ted was here to see this. It’s AWESOME!” Ducky exclaimed. “Ducky, we can’t get distracted now! Abigail is counting on us. We need to find the crown jewel exhibit. Once there we need to figure out how to stop the cat pirates and rescue Abigail’s dad!” Pembleton said as they rushed up the steps to search the rest of the museum. 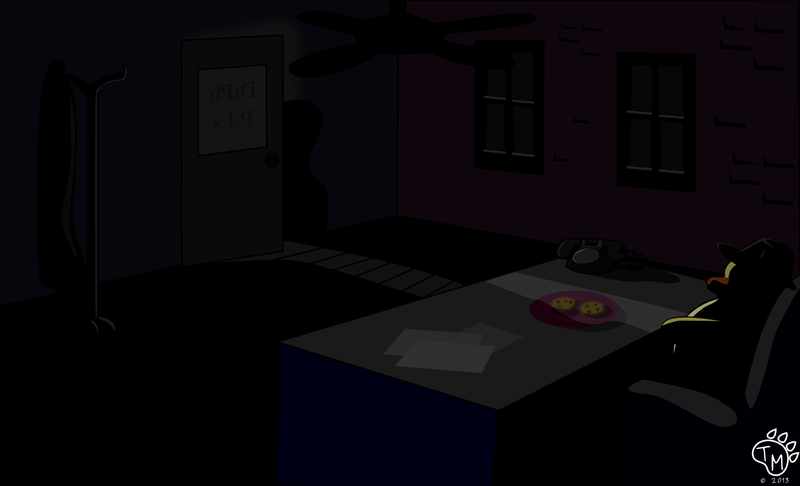 Late one night, Ducky was sitting in the DtPb PI office snacking on some cookies in the dark, when all of a sudden there was a knock on the door. The noise startled Ducky but thankfully not enough for him to drop a cookie. Ducky adjusted his hat and said, “Come in.” As the door slowly creaked open, Ducky didn’t know what to expect. He wondered, would it be an aardvark with an adventure, a monkey with a mystery, or a rodent with a riddle? When the door finally opened Ducky was surprized to find Ted huffing and puffing from opening that huge office door all by himself. Ted wanted to know if Ducky wanted to watch a movie together and eat some popcorn, while he manned the office. So they watched a movie and ate popcorn. 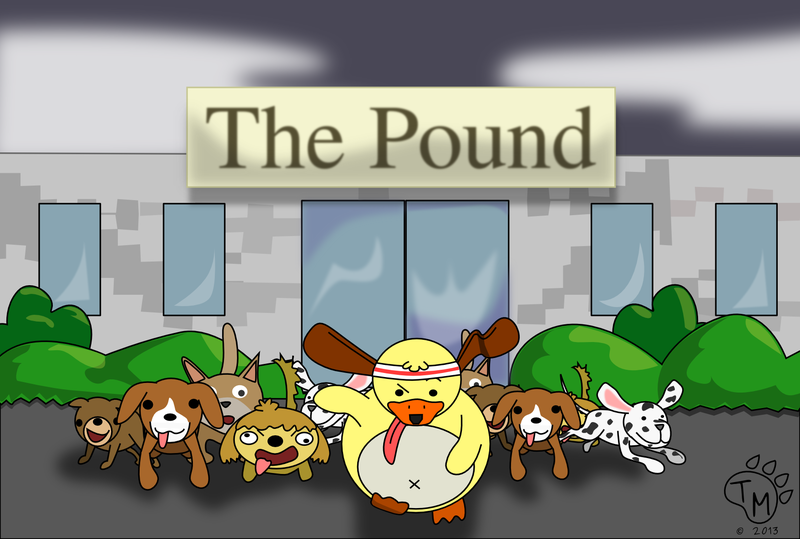 Earlier this week Ducky received word that his friend, Mr. Shnookums, had been picked up and put in to the pound again. Ducky knew he had to get him out, so he devised a top secret mission to get him out of the poky. Ducky, a master of disguises, donned his homemade puppy costume to go deep undercover. Ducky allowed himself to be captured. As the Human was carrying him to the back to the vehicle, he unclipped his keys and tossed them to Pembleton. Later that day, a cake was delivered to the pound right before closing hours. The cake was for a puppy named ‘Ducky’. The humans looked at all of the collars, and when they found the strange looking puppy with the name ‘Ducky’, they slipped the cake in to the cage. It took a lot of self control and will power to wait the 2 minutes it took for the staff to finally leave. Once the coast was clear, Ducky ate every last crumb, but thankfully did not eat the keys hidden inside. Then it was time to get to business. Ducky unlocked his cage, then Mr. Shnookums’. He was about to leave, when he heard some whimpering. The other little guys were giving him sad puppy eye’s and he couldn’t leave them there. He had to help them all escape! He unlocked every cage, even the ones with cats. And then they made a break for it. Thankfully Pembleton was waiting near buy with a van, that would take them to safety. Within a couple of days, Ducky and Pembleton’s relocation agency had found loving homes for all the little guys, even the cats. We’re Busting Out of Here!